You've just got to love the "bright sparks" living in this country. Camelot (our lottery people) have just pulled a scratch card from sale because too many people in Britain don't have the foggiest clue about how numbers work. 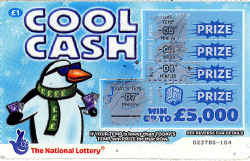 In order to win on the "Cool Cash" scratch card, gamblers players had to scratch away a window to reveal a temperature lower than the figure displayed on the card. Now this is where it's gets far too tricky - the cards had a bit of a wintery theme so the initially displayed figure was often below 0. Sorry sunshine, but it is. How on earth do you manage to work out that your benefits are correct each month with those numeracy skills?